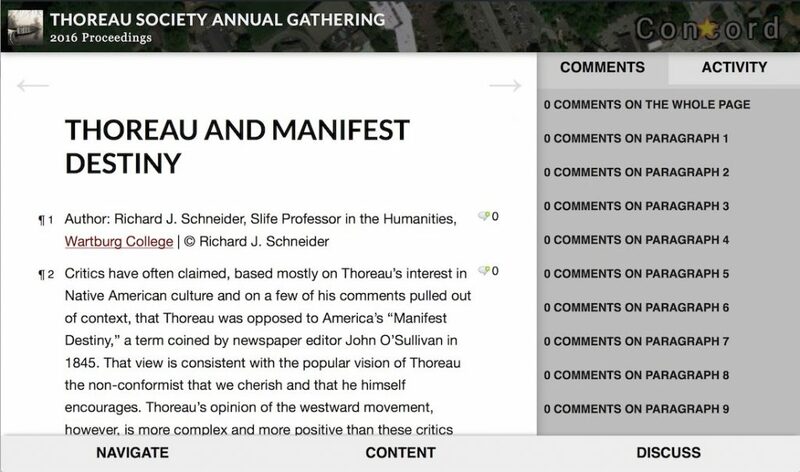 Promoting public engagement with Thoreau’s works is an important goal for Digital Thoreau. The internet has opened a world of possibilities for social reading: a way to share ideas about a text through comments linked to particular passages. To explore how we might create the richest and most flexible social reading experience of Thoreau’s Walden, Digital Thoreau is bringing together academics and other professionals interested in social reading for THATCamp Western New York, which will be hosted by SUNY Geneseo February 18-19, 2013. THATCamp Western New York is generously funded by an Innovative Instruction Technology Grant from the State University of New York. Code for America fellow Eddie Tejeda, the creator of Digress.it and the lead developer of Regulation Room, will be among the participants. Learn more at the website for THATCamp Western New York, and follow @thatcampwny on Twitter.